Due to its acquisition in January, the Dollar Photo Club announced via its Facebook page that it is finally closing its doors for good. It is terminating all its services in April 15, 2016, which means members will no longer have access to their images and purchase history. The stock photo website has been in business for over two years, and sadly it will no longer be available in less than two weeks. Thus, it is time for you to sign up to a Dollar Photo Club alternative today. Adobe Stock. Adobe Stock is the stock site that acquired the Dollar Photo Club. By signing up to the website, you will be able to access and use your remaining image downloads. You will also have exclusive discounts for one year – $9.99 for 10 images per month. However, these benefits are only valid for one year. After that, you will be billed with regular subscription rates. Shutterstock. Shutterstock offers high quality images for every budget. It has over 70 million stock photos in its collection, but for a fairly higher price than the Dollar Photo Club. While you may find everything you need for your creative projects in its library, you will have to stretch your budget a bit more. iStock. 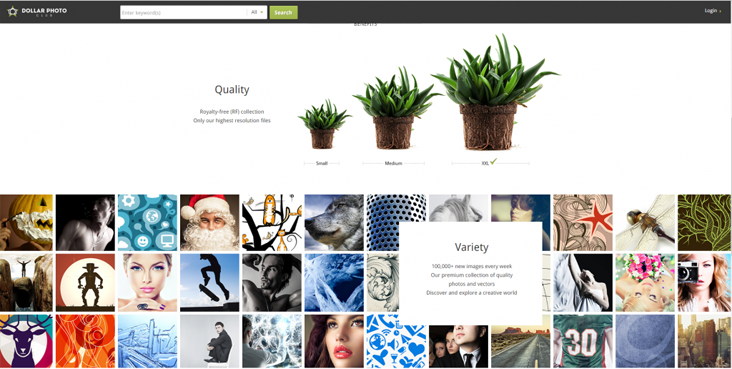 iStock allows you to explore millions of high quality images at ridiculously great prices. It has a new feature that allows you to rollover your unused subscription downloads. While the stock site offers incredible stock at flexible pricing, the cost is many times higher than the Dollar Photo Club. 99 Club. 99 Club is the perfect Dollar Photo Club alternative for expired members. It offers 200 XXL images for the same price, $99 per year. If you need more, you can also download images for $0.99 each. The stock site also offers the same kind of experience. It has no additional fees, download limits, and auto-renew. Moreover, the images have no expiration which means you can use them forever. These are 4 of the best stock photo website in the market. All are good stock photo sites, but not all are good Dollar Photo Club alternatives. If you are looking for the same kind of product at fairly the same price, you should check out 99 Club. It offers double the amount of image downloads for only $99 per year. However, it is only available for limited number of customers. Sign up today to avoid disappointments. The Dollar Photo Club is one of the best stock photo agencies in the market. It offers only the highest resolution files with royalty-free license. It also offers a variety of premium collection with over 100,000 photos and vectors added every day. With DPC, members can choose between annual and monthly membership without hidden fees and commitment. They can also enjoy downloads that never expire. It is no wonder that the stock is the world’s top photo club. If the DPC is so great, why is it closing? The website was acquired by Adobe’s very own photo agency. Thus, it is terminating its services in April 15, 2016. By then, many creative users will become orphans of the stock site. Fortunately, the Internet is filled with stock photo sites. They can check out other website to see if they suit their creative needs and budget. With the Dollar Photo Club closed, finding a better alternative becomes more inevitable. After two years of business, the stock site has finally decided to terminate its services. It offers its existing members a voluntary choice of transitioning to Adobe Stock or finding another agency. While Adobe Stock is a great stock site, it is not as affordable as DPC. It defeats most creative users’ reason of joining the latter. The Dollar Photo Club offers premium quality images for only one dollar each. Transitioning to AS means they have to pay 10 times more. What should they try instead? Both websites offer royalty-free license with their image collection. The license already include model and property releases. This allows creative users to use the assets in any project for as long as they like. With DPC and 99 Club, downloads never expire. Users can use their downloaded images forever. Both yearly plans offer high quality images with option to download additional images when users exceed the allowed downloads. Both stock agencies also offer high quality images in small, medium and XXL. XXL files can be used confidently with printed materials at A3 size with 300 dpi. With these similarities, DPC members can easily cope with the closure through 99 Club. The latter offers almost the same features and benefits, and much more. While the DPC offers 100 images in every 100 dollars, 99 Club offers twice more with 200 for $99. Users also do not have to worry about the website closing because it is not associated with DPC or Fotolia. It is a separate company that only offers the same product.